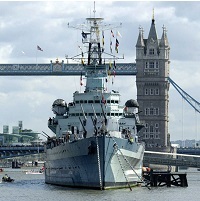 Explore HMS Belfast's nine decks to discover the stories of life on board this warship during the Second World War and beyond. Imagine sleeping in one of the tightly packed hammocks enduring the Arctic waters, or being stationed deep in the bowels of the ship when she opened fire in support of the Allied troops on D-Day. Venture into the interactive Operations Room, and immerse yourself in the midst of a battle in the Gun Turret Experience.